My 1994 945 NA has been intermittently sputtering recently, seemingly regardless of being at idle, no throttle, part throttle, or full throttle. The only exception is never at high RPM, at least not that I can tell. when it is running right its 100% fine. There seems to be no rhyme or reason as to when it happens, it just comes and goes. In the last year I have replaced the plugs and wires. This happened once before in February. I replaced the in-tank fuel pump and it seemed fine after that, so I thought maybe I had fixed it, but obviously I was wrong. I'm thinking it is the fuel pump under the seat, but that's basically educated guessing. Is there anything easier (and hopefully cheaper) that I should try before replacing the pump? My wallet is running pretty thin right now, so I can't just throw money at this thing until it works. Rex/Regina or LH2.4? You replaced the pump but what about the fuel filter? Did you gap the plugs and were they copper plugs? Copper plugs only last about a year now in my experience. Block distributor or back of the head? Have you replaced the cap and rotor? Gotta start with basic maintenance and be sure things are caught up. It’s a Bosch system. The distributor is end of the head. Come to think of it, how do I get it off? I’m not looking at it right now, but it doesn’t seem there would be room to get it away from the rotor. The head mounted distributor shaft seals commonly fail and allow oil into the cap which could be the cause of your sputtering. There's a seal kit available to repair them. Sometimes the housing wears and will need to be replaced. If the shaft wobbles really bad, that's the problem. There's just enough room to get the distributor off the back of the head after the cap has been removed. The shaft that goes into the back of the cam is short. Make a reference mark on the housing and head so it can go back in the same spot. There's a plastic plug under one of the screws that fits into the adjusting slot to locate the distributor but they always disintegrate and they're not available new anymore. Last edited by hiperfauto; 06-05-2018 at 08:15 PM.. There was oil in the cap, but it wasn’t a lot, and cleaning it up did nothing to improve the way the car is running. I will need to do those seals, but I’m still stuck on what’s going on with the way it’s running. I’m going to pick up a fuel pressure gauge tonight, and if that’s okay I’ll start pulling plugs and see what they look like. Fuel pressure should be roughly 35psi at idle, right? I checked the fuel pressure quickly. does 38psi at idle on a cold engine sound about right? That sounds about right. The spec is 300kpa (42psi) with the engine off and fuel pump relay bypassed. The pressure is reduced by the amount of vacuum present at the regulator. 18in Hg = 60kpa, so 300-60=240kpa or 35psi on a healthy engine. So, the cap, rotor, plug wires, and fuel pump are good. There doesn’t seem to be any play in the distributor. Now it seems to be idling smoothly, but when I rev it up it stumbles. The miss seems more consistent now. I’m guessing either a semi-bad plug (does that even happen?) or a sketchy injector. Is there anything I haven’t thought of? Air leaks will do that. 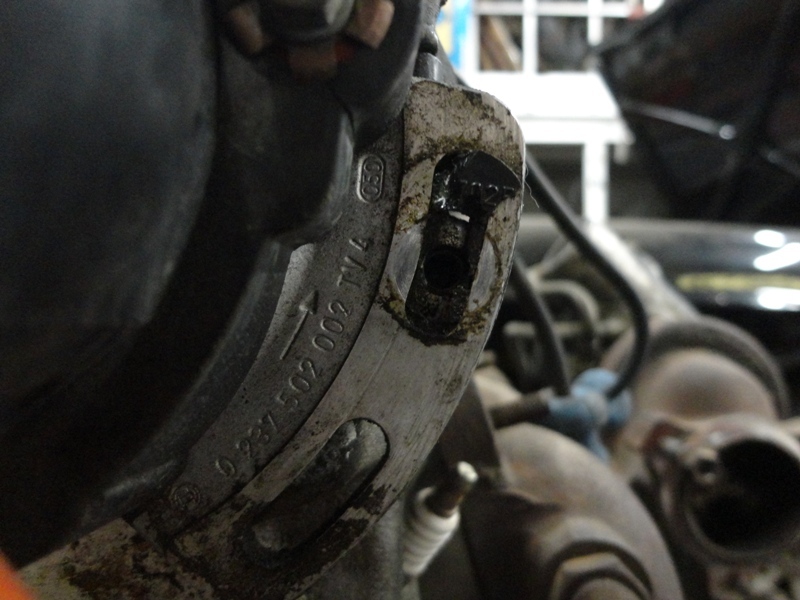 I had a loose hose clamp once at the throttle that was difficult to find. Smoke machine is my preferred tool to find air leaks. So I checked the plugs, and they all seem okay. Then I thought -maybe- the coil, so I went ahead and got a new one. After installing it I started it up to check the result. Sure enough, it didn’t fix the problem. I accidentally jumped out of the car with it in reverse, but with the parking brake cranked. When I did that it was having a sputtering fit, so one by one I disconnected the leads to the injectors. 1, 3, and 4 made it run way worse, but unplugging #2 had no effect at all! I think I may have found the problem, but just to be sure, how can I test the wiring? Buy a test light. It will confirm voltage. Or if you have a meter, even better. Could be a stuck injector. You say no spark on 2 and 3, so why would unplugging the injector make a difference. That doesn't add up. One can check the circuit with a noid light. A meter isn't the correct tool. A test light will confirm you have CURRENT to the injector positive. You didn't. Just test for current on the wires for the injector. If there's no current there you've found you problem. If it's there, the injector is stuck. Get a good used one. I have had had the tip of the spark plugl unscrew itself and cause misfires.